JCDecaux announces the next step in its digital rail expansion by unveiling the first ever 80” state-of-the-art digital screens at London’s St. Pancras International Station. Eight new screens will provide advertisers with digital Out-of-Home opportunities in key locations throughout the station’s retail space and concourse. St. Pancras will be the first station to benefit from JCDecaux’s new 80” digital screens. The screens are situated in close proximity to high-end retailers and will complement the two Transvision large-format digital landscape screens that are positioned either side of the departures board. In addition to Eurostar services, East Midlands Trains, Thameslink and Southeastern are serviced by St. Pancras. JCDecaux’s Motion@Waterloo won the award for the “Best Original Digital Billboard” at the DailyDOOH Gala Awards ceremony at Banqueting House, London on the 4th December. JCDecaux was shortlisted for the award, with The Trafford Arch and JCDecaux Airport’s GrandView taking second and third place. The judging panel, represented by industry experts from the UK, Italy, France, Germany, Spain and North America, came up with an original shortlist of six digital billboards they liked the most. Amscreen Digital Solutions has announced a partnership with motorway service operators, Welcome Break. As well as a five year renewal of the existing network of screens in forecourts and WH Smith retailers at Welcome Break locations, the deal will also see screens installed in break areas and team rooms to enable internal communications and better employee engagement. The renewal of the existing contract includes a network of 59 screens across the Welcome Break estate providing advertised brands the opportunity to reach over 1.2m visitors to these venues every 2 weeks. This estate represents a key part of their larger portfolio of 6,500 screens reaching more than 57m adults within a range of environments including garage forecourt estates across UK and Europe. The unique ‘plug and play’ technology featured in Amscreen’s digital screens will enable Welcome Break sites across the UK to communicate company messaging, employee updates, staff events and training news internally and in real time. With screens installed across their estate, Amscreen will take content from Welcome Break’s existing intranet system and broadcast it across the network, facilitating employee communications and improving engagement. BrightMove Media has announced plans to extend its London taxi network to 700 digital screens on top of 350 black cabs in the capital. The rollout of the technology will begin in September, culminating in the introduction of 400 new screens by the 1 October 2014, with a total of 700 screens being introduced by the end of the year. The top of cab service offers real-time, geo-targeted digital advertising. The latest GPS positioning technology enables brands to target specific groups of people at different times of the day – for example, “up-market shoppers” or “evening commuters”. The network is backed by a centralised media platform that allows real-time monitoring of the network, and enables campaign management and detailed reporting for brands. BrightMove’s moving media platform is the only Transport for London-approved product of its kind currently on the road. Since its launch in June 2013, BrightMove Media has run more than 20 campaigns, and displayed more than 50 million ads, for a range of London-based brands, including ‘Mamma Mia’, ‘Billy Elliot’, Pepsi, Cadbury, MasterCard and Hotel Tonight. BrightMove Media also reaches geographic areas that other out-of-home platforms cannot reach, such as the City of London. It’s one thing to see images of alluring undersea expeditions or exhilarating mountain treks, it’s an entirely other thing to actually swim the sea or climb the mountain – even if it’s only virtually. The immersive kiosk started out its tour of shopping destinations last month in Chicago’s Water Tower Place, before heading off to Los Angeles and onto San Francisco, Vancouver and Toronto. The Pearl Media team created, built and installed the interactive kiosk that is activated through gesture-based technology. DIY retailer OBI promoted their bespoke personalised paint-mixing system though an interactive application developed with their creative agency “Jung von Matt” and Wall Decaux. A webcam with a 55″ digital screen ran bespoke software installed into a bus shelter located in one of the most central and busiest locations in Berlin. The #ColourPicker software recognised the colours of the outfit of whoever was standing in front of the panel, and turned them into an individual personalised colour scheme. After the quick software analysis, people could download their unique colours using a QR Code and got redirected to the nearest store to pick it up. New eye-tracking technology has been launched in a bid to address the growing issue of accountability in outdoor advertising. 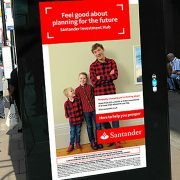 Developed by video network CScreens, the technology will for the first time allow advertisers to see how their campaign is performing across a number of out-of-home formats and locations – from billboards to televisions in pubs – showing the number of people looking at an ad, how long they are looking for, their gender and approximate age. The first campaign using the technology is set to run during the World Cup to measure audience engagement across TV screens at live ‘experiential’ events in London, over 330 pubs and 50 five-a-side football centres. For more than 50 years, relief organization Misereor has been creating development initiatives that fight against poverty and injustice in Latin America, Africa, and Asia. The organization takes every Euro it receives to support projects driven and owned by the disadvantaged and run by local organizations. To encourage people to donate to the organization, Hamburg-based agency Kolle Rebbe created an interactive donation poster that readily accepts credit cards and shows the donors the result of their donation on the spot. The Social Swipe is an interactive poster that has a slit in the middle where people can insert and swipe down their credit card to make a donation of 2 Euros. Swiping a credit card triggers an animation sequence that shows just what that simple donation can do to help the poor and disadvantaged. For example, the digital poster would display the bound hands of an imprisoned child and as the person swipes his or her credit card, the card cuts through the bonds of the child and sets the child free. In another sequence, the digital display would show a loaf of bread and as the donor swipes their credit card, the card cuts off a slice of bread to feed the hungry. The interactive donation poster was created with help from Stripe.com, a leading mobile payment provider. The interactive posters are currently installed at international airports. The Social Swipe provides people with an easy and engaging way to make a donation. It also gives them a visualization of where their donation goes to. When the donors receive their credit card statements, they will see the donation included in their summary of transactions along with an option to turn their one-time donation into a monthly one.